This innovative startup is measuring the pulse of the Island. It’s only fitting that the story of HereLab be in our Community Works section, because HereLab and our community are so intertwined. 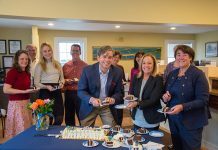 HereLab was started a year ago by Derek Fairchild-Coppoletti of Oak Bluffs and Patrick Phillips of West Tisbury. The name comes from the notion that here, where we live, can be used as a living laboratory to measure our environment: the ponds, trees, forests, and farms — even our towns. What’s more, the community, especially local students, is integrally involved in the endeavor. It all begins with something called the Internet of things. Wikipedia defines the Internet of things as the network of physical devices, vehicles, buildings, and other items, embedded with electronics, software, sensors, actuators, and network connectivity that enable these objects to collect and exchange data. To illustrate this concept, I joined Mr. Phillips at the Island Grown Food Hub, a 40-acre working farm with a 31,000-square-foot greenhouse operated by the Island Grown Initiative. 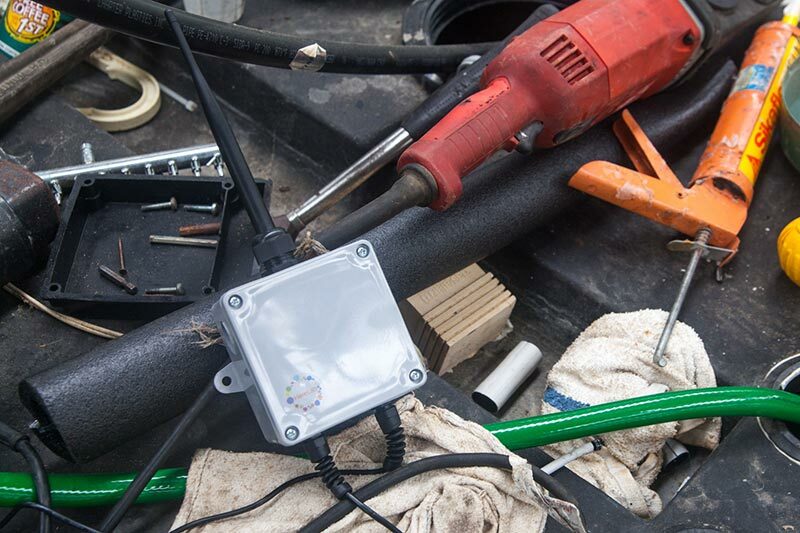 The farm is currently being equipped with HereLab sensors intended to monitor growing conditions and increase the efficiency and productivity of the farm. 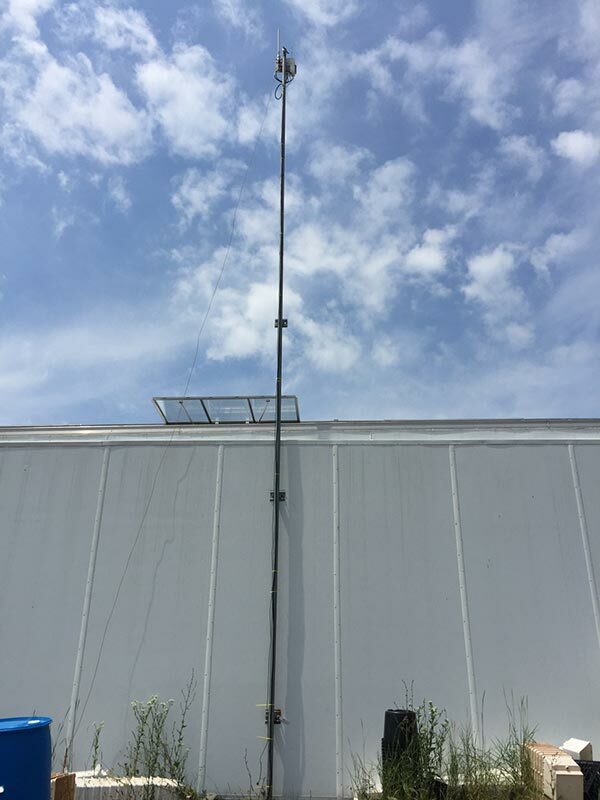 Mr. Phillips takes me into the cavernous greenhouse, points to a small silver box on the side of a steel pole, and explains that this is a gateway, a receiver/transmitter that enables sensors to connect and transmit to the Internet. 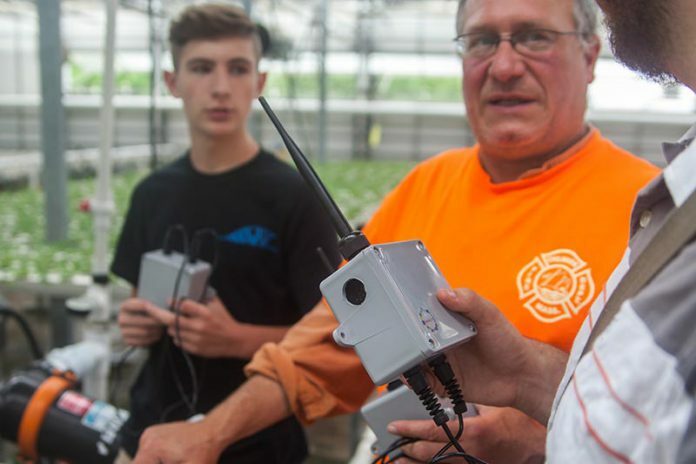 Sensors are placed in the soil next to plants in the greenhouse and throughout the farm — the gateway has a line-of-sight range of 10 miles — and they measure water, soil, and air temperature as well as humidity and barometric pressure. They’re like a little weather station. Enabling Island Grown Food Hub to know air and soil conditions can make farm processes more efficient. 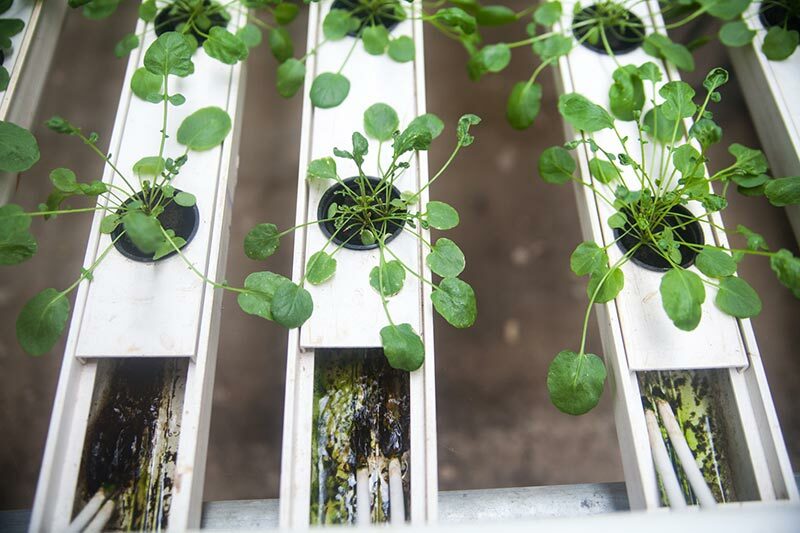 It can inform when and how much to irrigate, maintain ideal temperature thresholds — the hub hopes to reduce energy costs by as much as 20 percent through the use of this data. 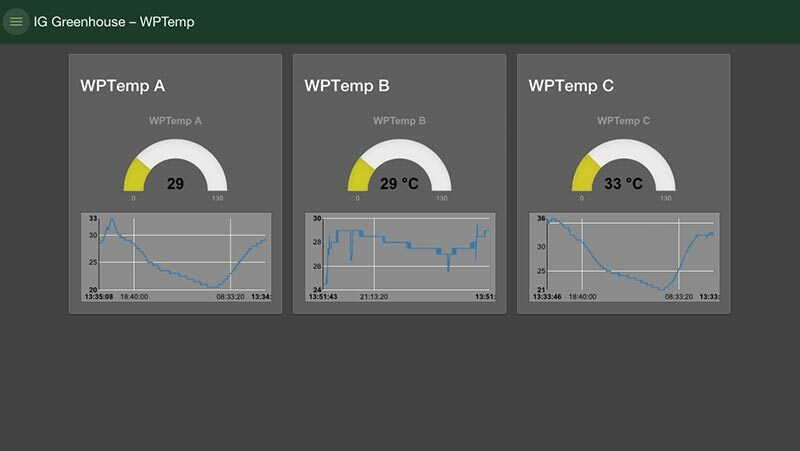 HereLab is also in the process of working with Polly Hill Arboretum, using humidity, temperature, and light sensors to study canopy phenology — essentially the study of the effect seasonal changes have on tree growth. 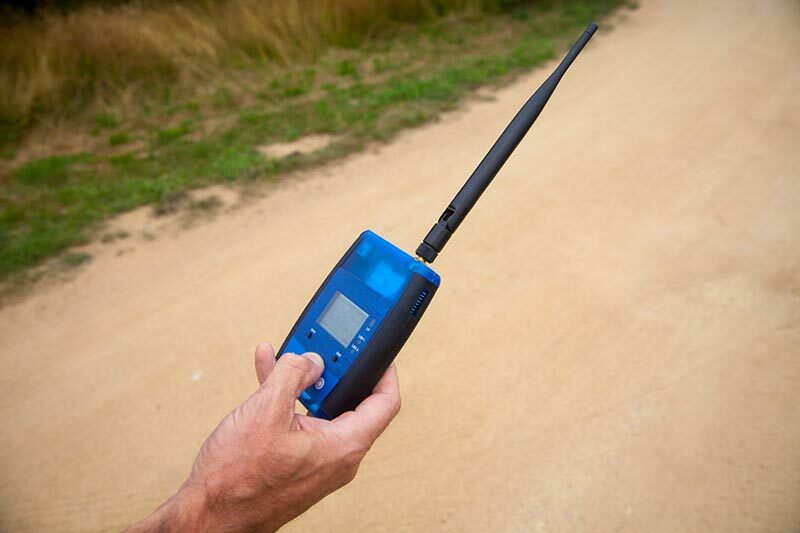 It will also be able to assess what effect, if any, climate change is having on local forests. Polly Hill will have a gateway affixed to the chimney of its cow barn, and sensors placed in trees throughout the arboretum. 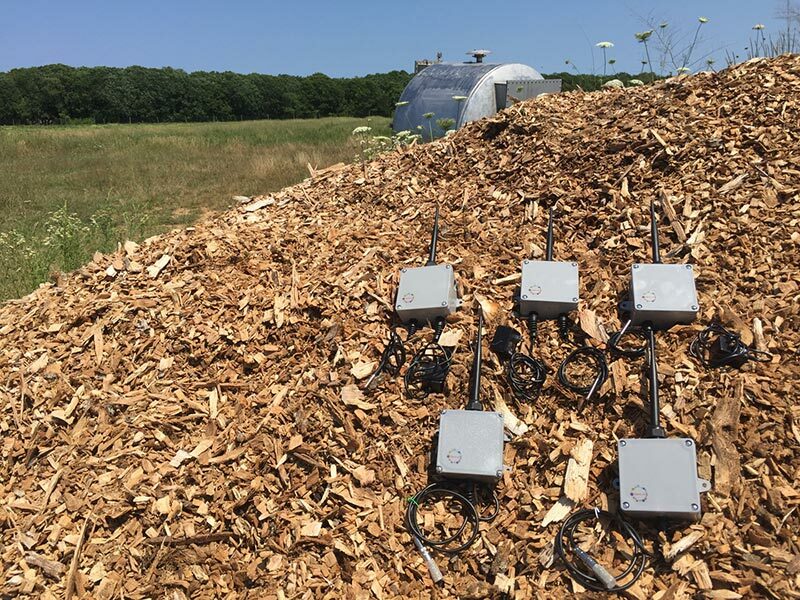 In the past, Polly Hill has used time-lapse photography to record seasonal changes, but the HereLab sensors will be much more cost-effective. HereLab is about to take on its most ambitious project to date: working with the Great Pond Foundation to better understand Edgartown Great Pond. 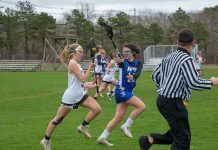 “We’re hoping to build 10 dissolved-oxygen and temperature sensors that will go in the water and help us understand the diurnal patterns of temperature and oxygen in the pond,” said Mr. Phillips. “It’s challenging because the environment, with water and potentially ice, is so demanding.” But this data will hopefully provide a better understanding of things like the impact of opening the cut to the ocean, or give the team the ability to track the growth of new and perhaps invasive plant life. 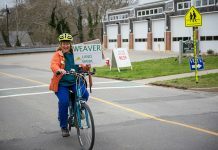 This week, HereLab will install one gateway in downtown Vineyard Haven, creating the Island’s first “Smart Town.” They soon will run pilots to measure energy use, trash accumulation, traffic, and tide heights, with the goal of making the data public as possible to enable a real-time, Island-wide, public environmental data resource. So in a year’s time, HereLab has made some big strides, but what’s equally impressive is how they’ve gone about doing it. 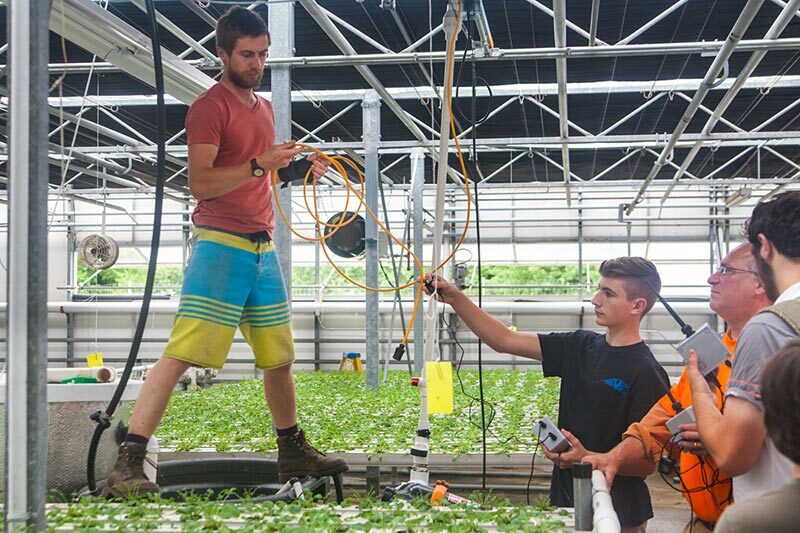 HereLab’s mandate is not only to help farms and environmental organizations grow and be more productive, they want to help Island youth grow and be more productive as well. This is the social contract they’ve built into their organization, and it makes them quite unique. 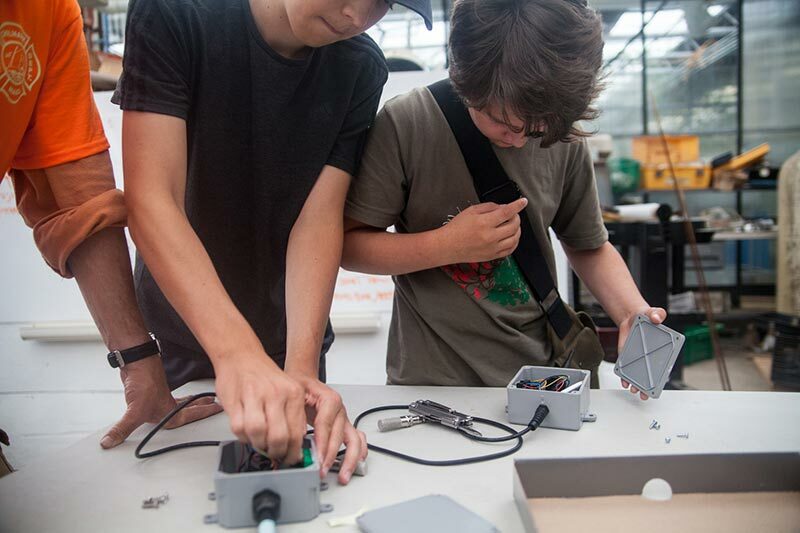 Last year they started teaching high school kids and kids at the West Tisbury School how to build sensors. This summer they are holding three STEM (science, technology, engineering, and math) camps, and the kids they taught last year are acting as interns in the camps. 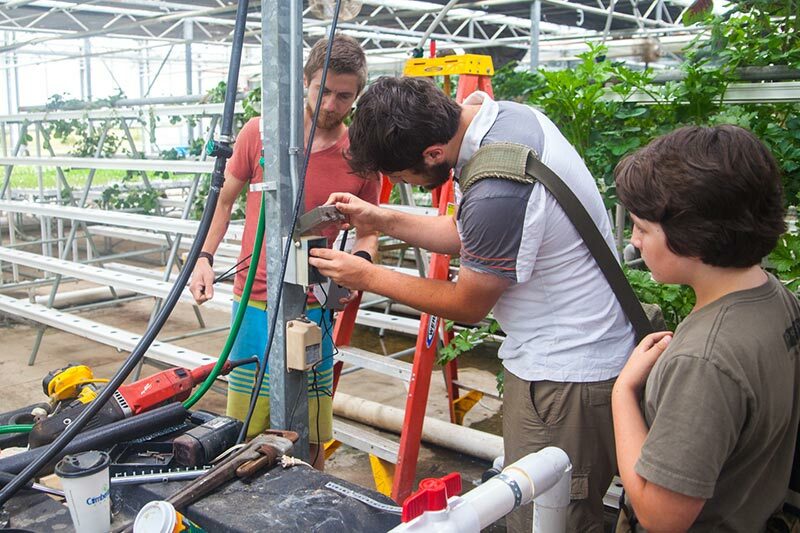 The first STEM camp, Ag Lab, was held in July and hosted by Island Grown Initiative. 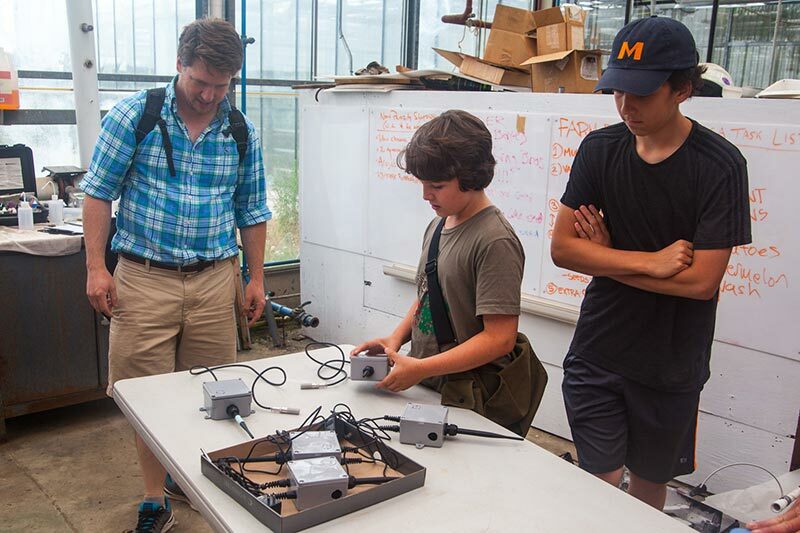 For five days the campers, who ranged from 11 to 56, learned to build sensors, and at the end of the fifth day, they deployed them around the greenhouse and farm. The next camp, called Tree Lab, will be offered in conjunction with Polly Hill Arboretum, and starts on August 8. And the final camp of the summer, called Pond Lab, will start on August 22 and be offered in conjunction with the Great Pond Foundation. 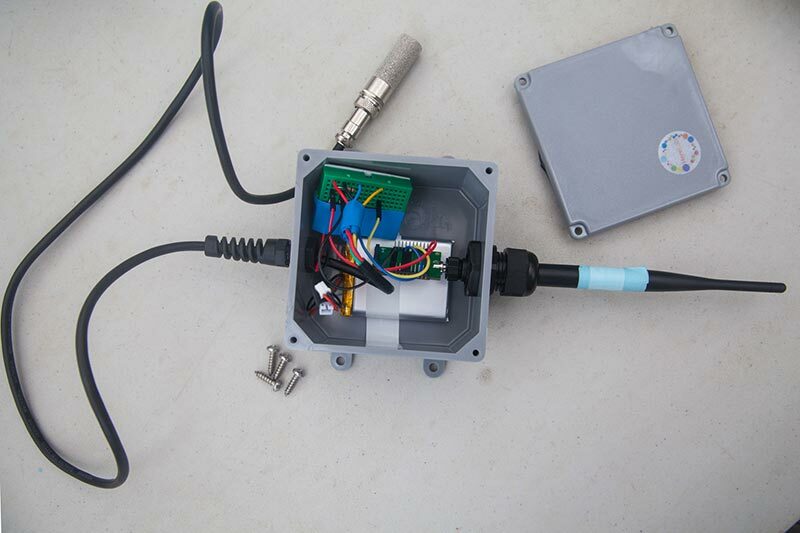 All the sensors built in all of the camps are donated to the hosting organizations. 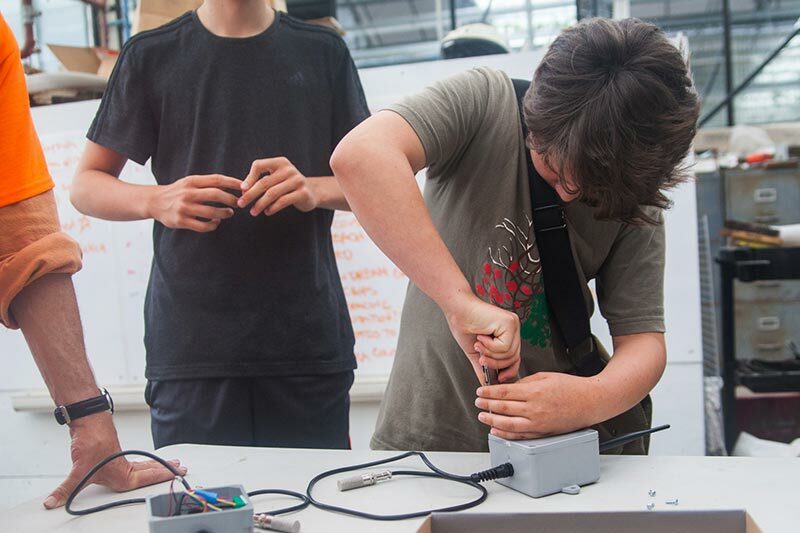 It certainly sounds like a winning combination: Local kids get a leg up on what could be a long and rewarding career; local farms and organizations benefit from valuable technology — but these STEM camps, are they actually any fun for kids? A HereLab “Public Good IoT” discussion will be held Thursday August 4 from 7 to 9 pm, open to the Island community. Email info@herelab.io for more information. 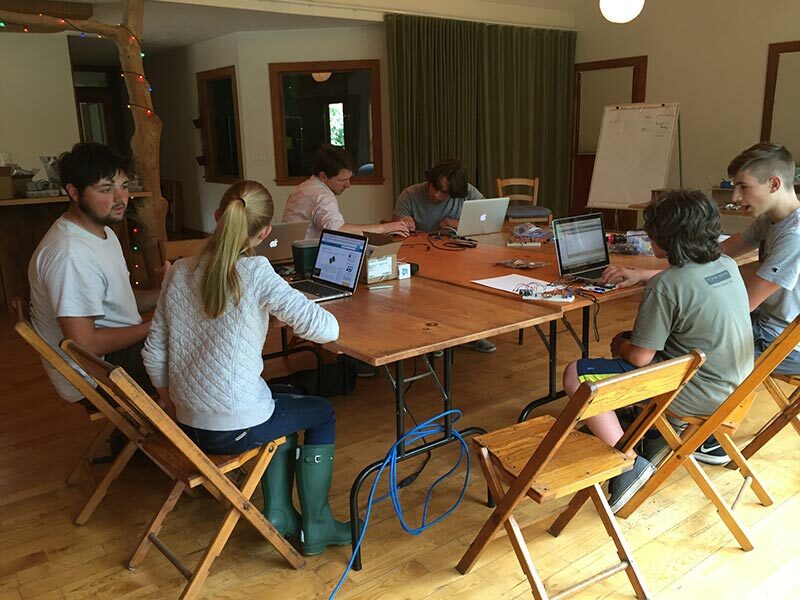 For more information about the upcoming HereLab Pond and Forest STEM camps, go to herelab.io/stem-camps.